HENRY GIROUX: Oh, I mean, I think that’s the biggest lie of all actually. The biggest lie of all is that capitalism is democracy. We have no way of understanding democracy outside of the market, just as we have no understanding of how to understand freedom outside of market values. I learned about two maps that show the connection of corporations. I found copies of them at Occupy Educated. The first one “Corporate Connections” was created in 2003. You can read about it here. 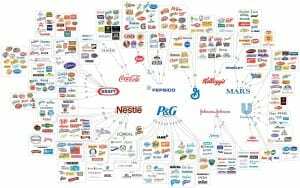 The second one is a condensed update looking at just 10 corporations and the brands which they control. These two maps make me think of all sorts of things. Like, do we have choice in the market place? Do we have choice in the market place of ideas? Choice of ideas are professed to be necessary for a healthy capitalistic system. It is ideas that compete not products as they only represent an idea. International trade agreements. Are they preserving the citizens action of choice of an idea as it relates to that prime condition for capitalism to work? Do the keepers of the knowledge of all things that are capitalism even have this book in their library? Then there is our own issue of corporate citizenship butting heads against human citizenship and equality of power. 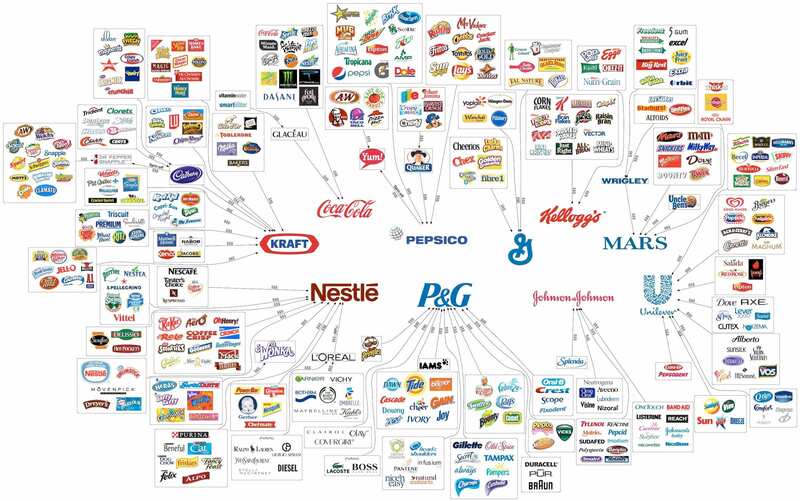 Can any one person be so influential as one of these corporations? Would a completely united citizenship in anyone nation be as powerful and equal as a world corporation? As we extent, humanize a human creation and imbibe it with rights considered acquired via the process of birth from a human sperm and egg combining can we expect to have dominance over our creation? Corporations are still currently a creation of law which is a creation of our choice. Then there is the issue Beverly raises here. Extending religious freedom to a corporation. Can I have religious freedom with such corporate interconnectedness if they have religious freedom? Is there still choice? Would not the need to assure choice in the market of ideas, if corporate religious freedom is extended then require a remedy of breaking up such corporate dominance in the market which could reduce choice of ideas to assure religious freedom? Even to assure the religious freedom of corporations, would consolidation not further reduce another corporations religious choice? Within all this “choice” issue we decided to use democracy. Such a governance is dependent on one singular choice: The agreement to agree. Can there be choice beyond this agreement when one chooses not to agree? From this past week’s Bill Moyer’s and Company: Henry Giroux. When he said that, you know, you not only have to have personal freedoms and political freedoms, the right to vote the right to speak, you have to have social freedom. You have to have the freedom from want, the freedom from poverty, the freedom from– that comes with a lack of health care. HENRY GIROUX: A citizen is a political and moral agent who in fact has a shared sense of hope and responsibility to others and not just to him or herself. Under this system, democracy is basically like the lotto. You know, go in, you put a coin in, and if you’re lucky, you win something. If you don’t, then you become something else.